AirAsia announced on 11-Jun-2013 that its LCC joint venture with All Nippon Airways has “been facing some challenges attributed to a difference of opinion in management, most critically on the points of how to operate a low cost business and operating from Narita,” and that it “would not rule out any options... including dissolution of the joint venture”. This is tantamount to talking of “irreconcilable differences” in a divorce case. If the two airlines have been unable to consummate something that meets their mutual goals after almost a year of operations, this is an ex-marriage. Even ANA, less bluntly, effectively acknowledges that the partnership hasn’t worked and that it is considering combining the operations of its part-owned Peach with the residue of the AirAsia Japan operation. So where to next? The next steps could be the genesis of a whole new scenario, or – something less. AirAsia might withdraw completely, form a financial JV partnership – or perhaps go back to talking to Skymark. Over the past 20 years, whenever the LCC phenomenon arrived in a new region, there was a familiar chorus of “this region is different. LCCs won’t work here”. That was for example the attitude in Southeast Asia 10 years ago; today over a quarter of all international seats are on LCCs – the largest genuinely international low cost market in the world. The same was said in India a few years later; today 70% of all domestic seats flown in that market are on low-cost airlines. Then there is Japan. Perhaps things really are different there? There is certainly a level of inertia and high cost attitude that separates it from the rest of the world. Then again perhaps it’s just that the road to low cost is a little more tortuous. The only independent – relatively low-cost – airline to have survived in Japan is privately held Skymark Airlines, based at Tokyo. The carrier commenced operations in 1998, and operates domestic services from its base at Haneda’s Tokyo International Airport. Other features he did not mention were the high cost, near-duopolistic supply of ground services and a regulatory attitude (gradually evolving) that bears little relationship to commercial operational needs. 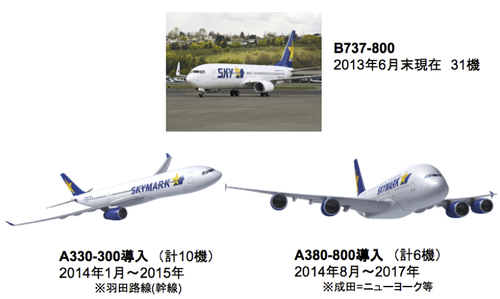 In the midst of this, Skymark has become an interesting amalgam of an airline. Formed on its cost-conscious foundation, it has enjoyed a number of years of profitability. 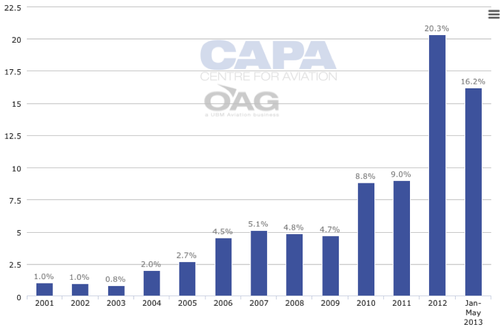 Even in the year to Mar-2013, as the new LCCs entered the market and Skymark expanded rapidly, it has remained profitable, although the trend is self-evident. This success is despite its being very much the third largest airline in the country, well behind the big two, about an eighth the size of ANA and less than 20% of the size of JAL. 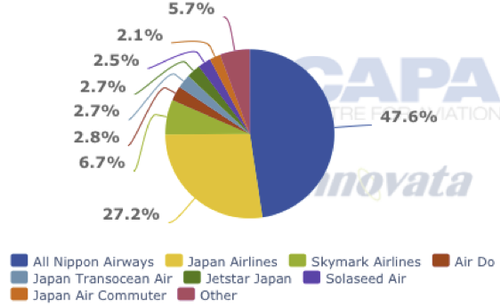 Skymark currently accounts for only about 4% of total seat capacity in Japan, according to CAPA and Innovata data. To survive in this company, in a country which tends to favour the two major incumbents (complete with their ground services dominance), something has to have been done right. Other so-called LCCs have come and gone this century, often, like Air Do and Starflyer, lining up with one or other of the big two as an alternative to closing down. More recently Skymark has decided to embark on operations with larger aircraft and an ambitious international network scheme, making for an unusual hybrid. But then Japan’s market is unusual. More of that later. Then, in 2012, the new world arrived, with no less than three new LCCs entering the market, all joint ventures with ANA (Peach and AirAsia Japan) or JAL (Jetstar Japan). There is no doubt that, even despite their small size, there has already been a mini-revolution in the country’s aviation system and among travellers. Indeed, in the domestic market, only Jetstar Japan has achieved more than a 2% share. It is no secret that Jetstar Japan has been losing money at this early stage in its roll-out, but it has been delivering relatively good operating statistics and is embarked on a long term strategic mission and parents Qantas and JAL have been longstanding partners too. Moreover the Jetstar brand is already well recognised in Japan, thanks to several years of international operation by its Australian-based long haul arm. Peach (with Hong Kong part owners) too has apparently quietly been the best achiever, most recently reporting a 78% load factor for May-2013, with an 81% on time performance. But the AirAsia-ANA partnership has not been a happy place. Although there was an excellent rapport between the heads of the two organisations, lower down the body the chemistry simply did not match. And when a low-cost airline is forced to adopt high cost practices, the flaw is unavoidably fatal. Also, as the AirAsia media release points out, it was not just an inter-airline management issue; the words “and operating from Narita” point to the disadvantage for the JV of being based at a substantial distance outside Tokyo, as well as being head to head with Jetstar Japan, also based there. Peach by contrast, has Osaka’s Kansai low cost market virtually to itself. According to the AirAsia Group most recent accounts, AirAsia Japan incurred a net loss of MYR97 (USD31 million) million in calendar 2012 and MYR67 million (USD21 million) in 1Q2013. The financial situation in Japan has been deteriorating. In the previous quarter, 4Q2012, AirAsia Japan incurred a significantly smaller loss of MYR40 million (USD13 million). AirAsia Japan currently operates only four A320s but had been planning to expand its fleet to seven aircraft by the end of 2013. AirAsia has found it challenging to try to fix the situation in Japan as it has not been in control. Instead, an ANA team with fixed legacy ideas about running an airline has run the carrier. Faced with the losses and internal concerns, AirAsia Japan underwent a change in management in Dec-2012 but ANA got its way and once again appointed one of its own executives. AirAsia has been frustrated at its inability to bring in its own people and be more aggressive at to trying to right the ship. The problems in Japan come at a time when AirAsia faces a new challenge in its and very profitable original home market of Malaysia, where its arch-rival Lion has launched a new joint venture. Meanwhile the group is battling to increase its presence in Lion’s home market of Indonesia, where its affiliate Indonesia AirAsia is also preparing for an IPO. Another JV, AirAsia Philippines, is doing only slightly better – after a net loss of MYR93 million (USD30 million) for FY2012 and MYR20 million (USD6 million) in 1Q2013. The carrier still only operates a fleet of two aircraft even though it has been more than a year since it was launched. After a rocky first year and several network changes, AirAsia Philippines is now attempting to turn the corner by partnering with another Philippine LCC, Zest. One possibility is that AirAsia could use the aircraft it initially intended for Japan to fight off Lion in Malaysia and Indonesia. Thai AirAsia is also keen to accelerate expansion as it faces intensifying competition from Nok and the prospect of a new joint venture, again with Lion involved. AirAsia India, which aims to launch services in Oct-2013, is yet another entity which will need aircraft and attention. There are huge opportunities in India – but also challenges. In these circumstances AirAsia could perhaps benefit from one less affiliate as it would free up resources – intellectual and physical – for its five other markets. The first step is likely to be a formal announcement of dissolution of the ANA-AirAsia agreement. The intriguing question then is what happens next? There is no doubt that the Japan market is ripe to be opened up to low cost travel. High domestic short haul yields still frequently lead the world. And, despite last year’s upheaval, the proportion of LCC seats in the Japanese domestic market is still relatively low, even when all the quasi-LCCs are included. If only the three genuine LCC 2012 start-ups are included, they hold between them around 5-6% domestic share, while Skymark has another 7%. So there is room for a much more aggressive presence. One question this raises for AirAsia is whether the first-mover advantage really exists in the inertial Japanese market. In several of AirAsia’s previous moves, being the first main player has decidedly delivered benefits; this may not be the case in Japan. However, not being present when things are changing presents the risk of missing out on establishing in key areas. For example, highly successful Chinese LCC, Spring Airlines, has made it clear that it wishes to establish a local Japanese JV with financial partners – something held in abeyance till the backwash from the China-Japan spats over island territories blow over, as it soon will. There are initial expenses to be borne, but if the partnership – whatever it may be – is fundamentally sound then the investment will be worth it. In the case of ANA, that old LCC adage, “make mistakes quickly” (and withdraw) would certainly seem to be the guiding principle. Firstly: find a financial partner. This might be difficult and also almost certainly requires recommencing the process to gain a new Air Operator’s Certificate (AOC); there is also the possibility that the still-existing agreement with ANA limits AirAsia’s freedom to develop relationships in the Japan market. But this approach has the marked advantage that many of the key operational matters that generate lower costs can be kept under the control of the managers who best know how to do it. While ANA and JAL were going through their agonisingly long period of “studying” the LCC model, which had been operating for decades in other parts of the world, AirAsia had been quietly in conversation with the one airline in Japan that appeared to have some concept of low-cost operations – the compact and profitable Skymark. Shortly after ANA finally concluded its minority financial JV with Hong Kong’s First Eastern investors and Japanese parties to form Peach (eventually beginning service in Mar-2012), it became known that AirAsia was apparently about to conclude a JV with Skymark to enter the market. ANA’s earlier timidity went out the window and suddenly it was the proud parent of no less than two low-cost offspring. But happy twins they were not. The Hong Kong investors were considerably less than delighted at the new arrival, but the obvious conflict was somewhat diluted by basing Peach at Osaka’s Kansai Airport and AirAsia Japan at Narita (also Jetstar Japan’s hub). With one more Boeing 737-800 arriving this month, Skymark’s complement of 31 of the type is reached. The 10 A330-300s, which begin arriving from Jan-2014, will, like the 737s, be based at Haneda. But the six A380s, which begin arriving in Aug-2014 will operate from Narita. The “premium” style seating was a decision made so as to be able to differentiate Skymark’s domestic product from the new LCCs, an interesting decision, but one that the quirky Japanese market may adopt. There are a lot of things Skymark could learn from AirAsia. 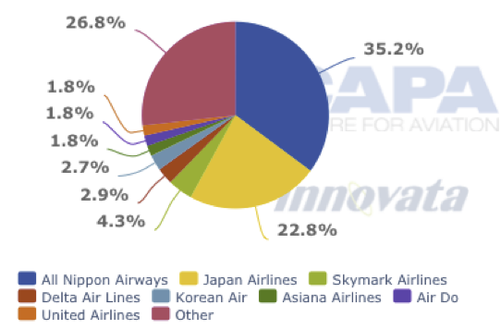 It would not quite be a marriage made in heaven, but, some support in Skymark’s established domestic network, along with an exclusive international feed from AirAsia could add a few valuable load factor points for the Japanese LCC. And, as Skymark progressively ventures into the international sphere, at first regionally with the new A330s, AirAsia has many well-honed skills to offer. Thus, when Skymark’s A380s start to arrive in 2014, feeding its new Narita hub will be a vital part of its success. The A380 long haul operation is a risky strategy, configured with just 394 seats (280 premium economy class seats and 114 business class). It will need all the friends it can muster to fill the New York-bound super-jumbos. As Skymark’s CEO observed, decades of inward looking practices have created an almost impregnable duopoly in Japan. This has strongly coloured the shape of that country’s essentially high cost and high priced industry. It also creates a level of inertia that is difficult to shake. However, at the core of airline operations is consumer demand and the growth areas are in low priced travel – especially where existing prices are well above global norms. The demise of the ANA-AirAsia operation – and possible combination of ANA’s two LCCs into Peach – is an important learning step along the way to a more competitive and cost-effective industry, where real consumer benefits can result. There has already been retaliatory pricing impact on some routes of the Shinkansen as a result of last year’s new entrants. But that is just the beginning of what will be a much more comprehensive overhaul of Japan’s transportation system. AirAsia is one operator that will assist in this metamorphosis; whether it is through what would be an intriguing partnership with Skymark, or in some other way, will probably unfold in the near future. Meanwhile, Jetstar/JAL and ANA/Peach will progressively disrupt a system that is long overdue for change.